The holidays are all about time spent with friends and family. Rather than turning on a holiday movie or sending the kids out to play in the snow, encourage your kids to get to know their grandparents better. This is your opportunity to bring the generations together with the magic of holiday crafts. See our ideas below! Kids love to get messy and create things with their hands, and they’ll love if Grandma joins in on the fun. This moldable Grinch Goo is fun to make and even more fun to play with. Combine the glue, the extract and 1 1/2 cups of warm water in a bowl. In a separate bowl, combine the borax and 1 1/3 cup of warm water. Tip: If the goo is too runny or sticky, dissolve a small amount of borax in an equally small amount of water. Add it to the slime and this will make it easier to play with. Your kids will have a blast stretching and squeezing the ooey-gooey Grinch Goo. Hand Grandma some cookie cutters so that they can create even more shapes. All kids enjoy seeing their artwork displayed on the walls. Grandma can indulge their desires by helping the kids create their own giant candy cane decorations that they can hang up. Using marbles to paint abstract swirls on the candy canes is easy for the small kids and more fun than using a brush! Cut out a candy cane out of poster board that fits in the baking sheet. Place the candy cane cutout in the middle of the baking sheet. Add a few dollops of paint along the sides of the pan. Put the marbles in the paint. Tip: If your kids are too young to be trusted with marbles, opt for larger plastic balls instead. Once you have a wall’s worth of candy canes, lay them flat to dry. Have Grandma hang the candy canes up — under direction of the kids, of course. What brings generations together more than decorating the Christmas tree? Creating your own tree decorations! 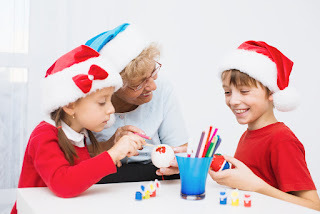 Grandma and the kids can swap holiday stories while they create these cute ornaments. You will be putting together the cupcake liners to create a tree shape. Each cupcake liner will be a tier of the tree. Fold the cupcake liner in half. Repeat steps 1-2 for 5 liners. Cover the top of the liner (the pointy end) with glue or tape. Take the next liner and place it on top of the first liner so its curved edge covers the glue-covered end. Repeat until you have a Christmas tree shape. Use glue to decorate with sequins, glitter or pom-poms. Lay flat to dry. Use the hole punch to punch a hole in the top and thread the ribbon through. Hang these cute little trees as ornaments. Let the little ones decide where on the tree they should go. Have the older kids join Grandma in creating large popsicle stick snowflakes. Not only are they easy to make, these snowflakes look like a high-quality home decoration. Grandma may even want to bring hers home! Make an asterisk with 3 popsicle sticks that connect in the middle. To make sure the sticks are evenly spaced, measure with a protractor. Glue the 3 popsicle sticks together in the middle. While they craft, encourage the kids to ask Grandma stories about her childhood and Christmases past. Whether your kids are still in diapers or well into their teens, they are never too old to spend meaningful time with their grandparents and create new memories together. Tracy Layden is a Certified Aging in Place Specialist. Born and raised in Silicon Valley, Tracy leads the marketing efforts at Alert-1, a personal safety technology and consulting firm dedicated to helping seniors live safely and independently. Tracy is a nationally ranked ballroom dancer and accomplished crafter – she can be seen covered in rhinestones head to toe as she whirls around the dance floor.